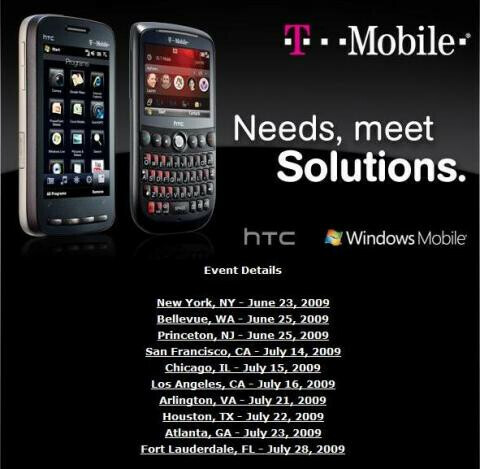 The summer is looking pretty hot for T-Mobile who will be showcasing some stellar devices thanks to Microsoft and HTC. The three companies are teaming up to kick start the “Needs, Meets Solutions” campaign throughout the country. Two of T-Mobile's soon to be available devices, the HTC Touch Pro2 and T-Mobile Dash 3G, graces their advertising campaign. The two Windows Mobile powered devices will be featured alongside the Android powered myTouch 3G and Bigfoot. Instead of relying on more entry level phones, the campaign is intended to feature the smart phone lineup this summer. The advertisement pictured displays some dates and locations for the event. When accessing their site, it appears that they have been removed – probably temporarily until they are finalized. But check back soon so you can find the closest event around your location.